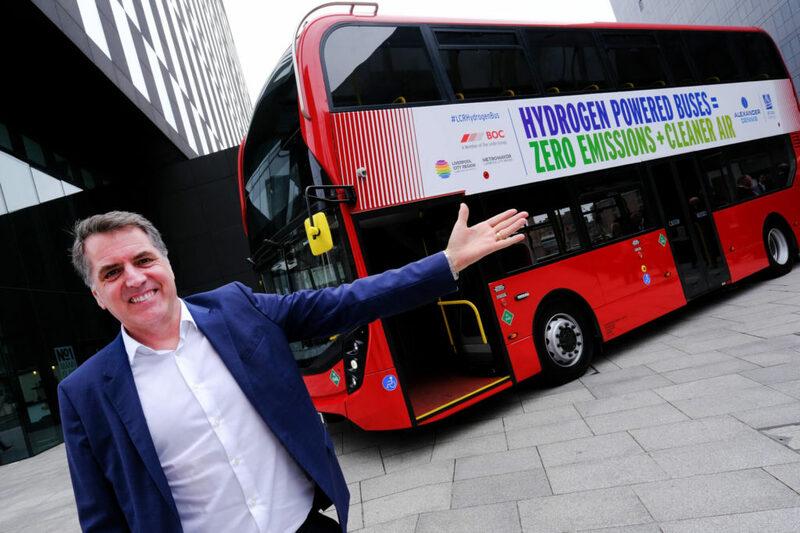 The Liverpool City Region is set to be the first place in the North of England to trial hydrogen buses following a successful £6.4 million bid to the government’s Office for Low Emission Vehicles. The bid was put forward by a consortium led by industrial gases company BOC, and including the Liverpool City Region Combined Authority and Arcola Energy, working with bus-maker Alexander Dennis, and will be progressed in conjunction with Arriva and Stagecoach, as members of the city region’s Bus Alliance. The Liverpool City Region Hydrogen Bus Project will see the creation of a new hydrogen refueling station at the BOC plant in St Helens, which produces hydrogen for industrial customers in the region and further afield, and will potentially see up to 25 hydrogen–powered buses on the streets of the Liverpool City Region, emitting nothing but water from the exhaust pipe. This initiative will contribute to the city region’s plans both to improve air quality and work towards a zero carbon economy by 2040. The first bus trial is expected to take place in 2020, subject to agreement with the Bus Alliance. The new refueling station will initially deliver 500kg of hydrogen every day. Crucially, the project aims to demonstrate the commercial viability of a model that installs refuelers for high-use fleets to develop a network for future use by passenger cars and other vehicles.